Welcome, AUSA Global Force Symposium and Exposition, to Huntsville, Alabama. We&apos;re so glad to have you here. (You could say we&apos;re... over the moon you&apos;re here.) The region is home to 909 defense contractors who collectively provide $5.6 billion in defense contracts for the U.S. government. Join 800 of your closest friends under the Saturn V at the U.S. Space & Rocket Center&apos;s Davidson Center for the 2019 Rocket City Bash on March 27th from 5:30 - 9 p.m. The Bash will feature a combo Tex-Mex and Italian buffet. Hotel Shuttles: Shuttle service between the participating hotels (except the Embassy Suites) and the Von Braun Center will be provided on event days only. Shuttle maps and schedules will be provided at a later date. Special discounts for AUSA Global Force attendees are available at select locations. To claim these discounts, you must present your AUSA badge. Hello from the Rocket City! The high-tech city of Huntsville which sprawls at the foot of a mountain in North Alabama is equally at home in the 19th century or the 21st. 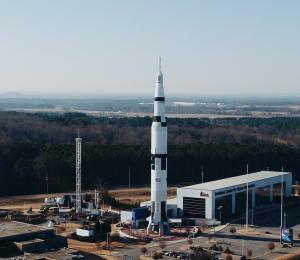 Huntsville&apos;s tourist attractions reflect the heritage of Alabama&apos;s first English-speaking city, the strife of the American Civil War and the accomplishments of America&apos;s rocket scientists.